An investigation into California’s criminal sentencing structure by NBC Bay Area discovered tens of thousands of convicted criminals serving time in prison longer than the sentence for their original, underlying crime, all because of California’s system of sentence enhancements. Critics and researchers say dozens of ‘extra’ provisions exist in California’s penal code which can be added on as sentence enhancements at the discretion of prosecutors. Those critics say the system has led to overcrowding of the state’s prisons, unfair and unjust prison sentences and inequity in sentences depending on the prosecutor and jurisdiction. In 2010, California’s prison system had become so overcrowded the United States Supreme Court ruled that being incarcerated in one the state’s thirty three prisons amounted to cruel and unusual punishment. After the Supreme Court’s order, efforts began to reduce the prison population by releasing many low-level offenders or moving them to county jails. The effort resulted in a population that currently stands at just over 127,000 inmates, down from a high of about 173,000 in 2006. But despite those reforms, California prisons remain overcrowded, standing at 133 percent of designed capacity. Advocates of prison sentencing reform say California’s system will remain expensive and dysfunctional until the state addresses the extremely long sentences that were handed out to violent offenders over the past three decades. 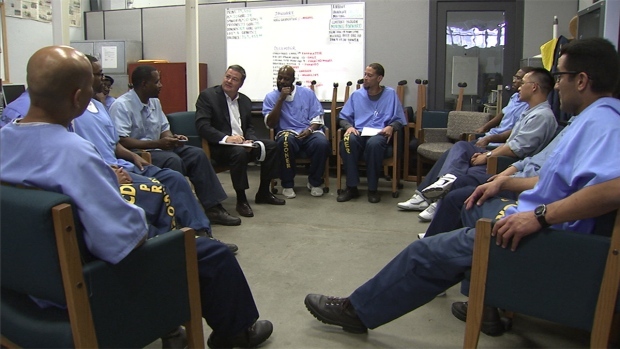 NBC Bay Area's Stephen Stock visits with San Quentin inmates for a conversation on sentence enhancements. Many prosecutors and lawmakers argue that sentencing enhancements are an effective deterrent against violent crime and say certain crimes necessitate extra punishment. But reform advocates argue these enhancements can be unjust because they punish inmates multiple times for the same crime. Advocates of reform also say sentence enhancements contribute to the high cost and overcrowding of California’s prison system by keeping many inmates locked up for decades past the point of being risks to society. These enhancements, such as California’s “Three Strikes” law or the “10-20-life” gun enhancement law, carry severe mandatory minimum sentences. And many say prosecutors often hold them over the heads of defendants to entice guilty pleas. Advocates of sentencing reform such as professor Vitiello and State Senator Loni Hancock also say the data shows that sentence enhancements are not effective in reducing violent crime. San Mateo County District Attorney Steve Wagstaffe disagrees that California needs further prison reform. Wagstaffe says sentence enhancements laws are working as intended. Wagstaffe, also the vice president of the California District Attorneys Association, says prosecutors and law enforcement have been able to work successfully with recent prison reform efforts such as realignment and Proposition 47, which reclassified certain low-level felonies as misdemeanors. But he says any further reform or reduction in sentences would go too far and present a public safety risk. 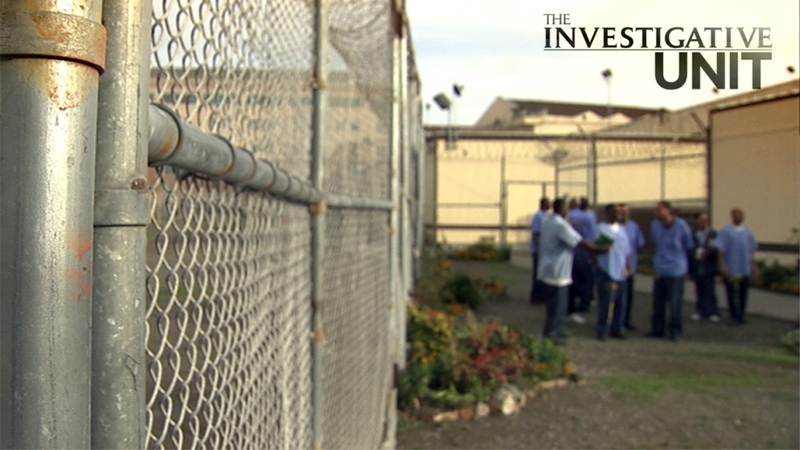 NBC Bay Area’s Investigative Unit visited San Quentin for a two hour conversation with inmates currently serving decades-long or life sentences because of sentence enhancements. All of them say they deserve to be punished for their crimes. But they question the justice and reason behind California’s sentence enhancement laws that will keep them locked up far beyond the sentence their original crime justified. Stephen Stock talks with Lizzie Buchen of Californians United for a Responsible Budget about prison reform. In a small space inside the newsroom for San Quentin’s inmate produced newspaper, a group of inmates sit in a circle dressed in dark blue uniforms talking about sentence enhancements. They’re all serving additional time, life sentences mostly, for enhancements that prosecutors added to the charges against them. For most, the enhancement carries a longer sentence than the sentence for the underlying crime for which they were convicted. “In 1999, I committed the act of killing my stepfather after he abused my mother and my little brother,” Antoine Waite said. Waite, 37, says he drove to his stepfather’s house in Sacramento to confront him about the abuse. Waite says his stepfather refused to let him inside, so he stood outside the house arguing with his stepfather through a screen door. The argument got heated, threats were exchanged, and then Waite says he thought he saw his stepfather reach for a gun, so he shot him through the screen door in self-defense. A jury convicted him of manslaughter and the trial judge gave him seven years. But seventeen years later, Waite still sits in San Quentin. Simply because the bullet traveled through the screen door, the prosecutor added an enhancement for “shooting into an occupied dwelling” at the time of trial, meaning his conviction carried a mandatory minimum 25-to-life sentence. Because the enhancement added by the prosecutor carried a mandatory minimum sentence, the judge had no discretion to alter it even if he believed it was too severe. “The screen door allowed me to have my seven year sentence enhanced to 32-to-life,” Waite said. Waite says he accepts the seven-year sentence for manslaughter. But a life sentence just because the bullet went through a screen door? NBC Bay Area’s investigation and review of California Department of Corrections data shows Waite’s case is not unique. While there is no specific data currently available on the number of convicted felons serving time for sentence enhancements, what data is available shows there are 40,000 inmates in California currently serving time under the “Three Strikes” law alone. “Three Strikes” is just one of dozens of possible enhancements prosecutors can add onto criminal charges. Other commonly used sentence enhancements include prior convictions, the use of a firearm, causing great bodily injury, shooting into an occupied building, shooting from a car, or being in a gang. The “10-20-life” gun enhancement adds 10 years for brandishing a gun, 20 years for firing a gun, and a life sentence for shooting someone in the commission of a crime. An armed robber who fires a warning shot, for instance, could face an additional 20 years on top of the robbery charge. The case of Demond Lewis, 42, also serves as an example of how prosecutors can stack enhancements on top of each other for the same crime. Lewis received a 15 year sentence for attempted murder when he shot another man in the leg. But during his criminal case a prosecutor added four separate enhancements onto Lewis’ charges, all tied to the same gun and the same crime. While Lewis got 15 years in prison for attempted murder conviction, he got another 94 more years for the sentencing enhancements. Lewis has been incarcerated since the age of 27, and without the enhancements, would have already served his 15 year prison sentence. But unless there’s a change in the law, Lewis will likely die in prison. While Thomas said he has a difficult time calling his sentence unfair because he took two lives, he questions the point of keeping inmates locked up for decades into their old age, causing prison overcrowding and costing taxpayers millions. Especially since data shows felons typically phase out of crime as they get older. Thomas says most felons get into crime as young men because of a lack of opportunity, pressure by gangs, or parents who were drug users or perhaps felons themselves. Thomas credits therapy and other programs at San Quentin with rehabilitating himself and the other inmates who spoke to NBC Bay Area. While Thomas says his chances of ever getting out are slim, he’s become a writer in prison and that gives him purpose. It’s a childhood that Lewis can relate to. Lewis also says he’s not the person he was then. He’s served 15 years and says he’s rehabilitated, but because of his sentence enhancements, he’ll never get to make that case to a parole board. Vitiello says sentence enhancements are largely a product of the tough on crime era of the 1980s and 1990s. Each time a high profile crime occurred, lawmakers would propose a new enhancement for that crime. Vitiello says as the criminal code continued to grow in size and complexity, sentences for violent crimes increased dramatically. According to a study by the Pew Charitable Trust, sentences for violent crimes between 1990 and 2009 grew by 63 percent. Vitiello says California spends an enormous amount of money on incarcerating aging felons. The professor wants to see comprehensive reform of the entire system, starting with the creation of a sentencing commission that would use data to determine what works and what doesn’t. DA Stephen Wagstaffe, who will soon become president of the board of directors of the California District Attorneys Association, disputes sentencing enhancements don’t reduce violent crime. Wagstaffe does admit that sentence enhancements give prosecutors a lot of power, but he doesn’t see a problem with that. While there’s controversy over the deterrent and crime-reducing effects of sentence enhancements, Wagstaffe believes they work. State Senator Loni Hancock agrees with Vitiello that California desperately needs prison reform. She’s been trying to push for that reform for years in Sacramento, but often runs into roadblocks. As chair of the Senate Public Safety Committee, Hancock says she spends a lot of time pushing back against new sentence enhancements proposed by her colleagues. She says the state spends far too much money on punishment and incarceration, and not enough on rehabilitation, drug and mental health counseling. 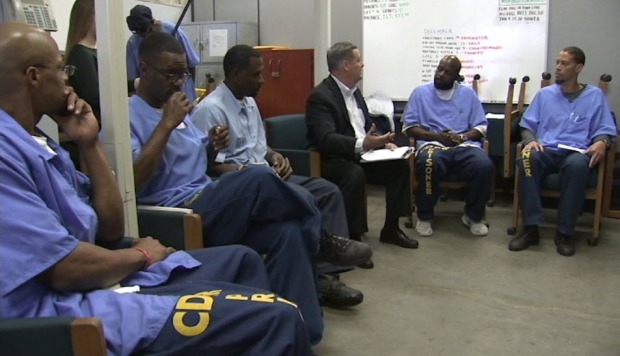 NBC Bay Area chief investigative reporter Stephen Stock meets with inmates inside San Quentin. Hancock argues that shifting resources towards those programs makes communities safer because they prevent crime, rather than punish people for crimes they’ve already committed. While she says we certainly need the element of punishment in the justice system, she argues our current sentencing structure goes too far. “We really need to change the culture in our prisons from a culture of punishment to a culture that acknowledges the ability of people to change and encourages that change,” Hancock said. Hancock recently helped pass prison reform legislation and says she’ll continue to urge her colleagues in the legislature to follow suit. “I think we’re seeing a recognition [by many lawmakers] that things have got to change,” Hancock said. But she says those legislative battles are often tough fights against heavy opposition. “Any reform that comes up, the lobbyists for too often the sheriffs, the DA’s, the police chiefs come up and oppose,” Hancock said. Meanwhile, while the debate over prison reform and sentence enhancements rages on the outside, Antoine Waite can’t help but think what might have been had he just been sentenced for his original crime without the enhancement. While he can’t change that, he looks forward to the day he walks out of San Quentin a free man.